As much as I love the winter months, nesting in, the beauty of the snow, the time to reflect and relax a bit, I have to admit that I am more than ready for Spring this year. We have had an exeptionally snowy and cold winter this year and I am just plain tired of it. 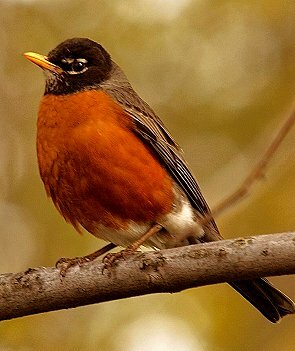 I’m seeing robins in my pond and they are a welcome sight! I am dreaming of potting my herbs and planting flowers, not needing to wear a coat, opening windows to air out my house, and getting out to take some walks again. Ahhh…that will be glorious indeed! I love watching our acres of trees and grass and plants coming alive, turning green..that will be a wonderful day! Ostara, or the Spring Equinox is coming up on the 20th. I need to get busy and get my altar set up, decorate for it, and start some spring cleaning…I love that too believe it or not! I love cleaning out closets, drawers, decluttering, simplifying, and getting in there and getting my hands dirty! My house looks and smells great after the spring cleaning! I’m lucky enough to have some help with that in my sister and daughter (hopefully! LOL). I am also anticipating my grandaughters first egg hunt and egg dying…she is 15 months old now and should enjoy it!! I can’t wait to see her in her pastel dress with her egg basket! Because of our extended family (who don’t know about our being Wiccan) we will celebrate on Easter with them..but for us Ostara is the big day. Little Lily will get to have both Ostara and Easter! Lucky girl. Today is the last day of the Olympics, and I have enjoyed the last two weeks thoroughly! I’m so proud of the American athletes..what a great job they did. The most medals for the first time ever in the winter olympics. Seeing the beauty of Vancouver has also been wonderful! I would love to go there some day. I especially loved the speed skating, snowboarding, skiing and figure skating! While I like the summer olympics, the winter olympics are by far my favorite. So here’s to spring, Ostara, spring cleaning and the Mother Earth getting ready to wake up and blossom in her Spring beauty! So last night my daughter Luna, sister Teagan my mom and I went to see Wicked on stage…all I can say is it was awesome!! I love the Broadway shows and have seen several but this show by far was my favorite! The two main actresses who played Elphaba and GAAAA linda! were amazing…they sang and acted beautifully and you could see that there was a real friendship between them..not just the one they were acting out. Something I didn’t expect was how funny it was…it was really hilarious..so joyful to watch. The crowd’s reactions were so great and a resounding “Approval” by everyone! Sure wish I could see it again but I think its sold out…darn it. My daughter Luna has wanted to see it forever and watching her enjoy it made my night..it made me happy to be able to give her that night and that memory. We will see it again for sure when it comes back or will travel to other cities close by to see it. The only thing I will say that made the night not “perfect”..was my mother. She is such a negative, critical person. All she could do was talk about herself, criticize everyone around her for what they were wearing, or their big belly, or their short skirts or whatever! I just about could have smacked her..she was somewhat blase about the show too…so frustrating. Thats the last time I take her to something like that! I despise negativity and try very hard not to be negative myself. It is a horrible vibe to have around you and very difficult to shrug off..especially when its my own mother and I can’t NOT see her! LOL..She goes to church every sunday and claims to be Christian, but putting down other people for their looks or whatever doesn’t seem very Christian to me. I grew up with her and should be used to it but I keep thinking as she ages she’ll soften but if anything she has gotten worse…oh well, I don’t need to go into all that and I refuse to let her ruin the lovely night at the show! Today I am working on some pages for my Book of Shadows based on “The Book of Witchery” by Ellen Dugan. I’ve said it in the past and I highly recommend her book. Its about the Correspondences for the days of the week and it’s a plethora of information! I love doing the pages for my Book so its a good day. I get this alot…from people who ask me about Wicca and being a Witch. While I haven’t “outed” myself to many people, there are a few who are aware of it just because of the fact that they are in my home enough to see it. I’ve explained in previous posts that I have a disabled daughter who requires home nursing care. There are 5 nurses in my home at various times who help me out. Because they are here, they see the books I have laying around that I’m reading, hear me talking about a spell I’m doing or a Sabbat I’m celebrating. Though I try to be private about it somewhat, this is my home and I can’t hide my lifestyle or who I am completely. While 3 of the 5 are totally accepting and even interested in knowing about it or learning about it more, one of them loves at least the crystal/herbal/oil spells and asks me to do them for her (such as passing an entrance exam) the 5th one is a problem. She is the typical Christian with the preconceived “evil” notions about the word Witch, I can say this because for a while I attended Christian church. While she insisted she’s not being judgemental, she proceeded to ask impertinent questions she would never ask a person of another religion, and though I patiently tried to answer the questions I felt willing to answer, hedging the ones that were private to me, and explaining things in a way I felt she should understand, her final answer to it all was ….I don’t understand. Though I suggested she read a book about it (I suggested Simple Wicca for a quick easy read) or she do some research on line at sites such as About.com…she just shook her head and again..I don’t understand. Infuritating needless to say!! While I’m not saying all Christians have this attitude, people in general balk at learning the truth about something they don’t understand. Instead of striving to learn about it before making an opinion, they just regurgitate what they’ve been taught or believe the preconceived notions without thought that they might be wrong about something! I think that is what is wrong with the religious sect in general. They all believe that their religion is the “Right” one. In my search for a spiritual path I could believe in and be comfortable with, I have studied or at least got a basic synopsis of various religions..I know enough to understand where they are coming from. This should be something people of religion should be willing to do..to learn before forming a negative opinion of another’s path. There is a commonality between most religions and that is the worship of a higher being..in whatever form they believe. The relationship we have with that higher being, God, Goddess, Buddha, Mohammed, The One, The Universe, whatever you call it..is what counts..not how we go about worshipping Him/Her/It. Religion is manmade, not God Made. Wiccans believe..Do as you will, and Harm None. To me this means, let people have their own beliefs, religion, way of life, without judgement or harm to others. Isn’t that beautiful…God/Goddess put us on this earth for the soul purpose of loving each other, taking care of each other, learning life’s lessons, and loving them. Thats it…very simple. As a Witch, I know that I will encounter even worse things than “I Don’t understand” but I think this is the attitude that will bother me the most. It is very easy to find a way to understand if you WANT to. I’m not asking anybody to change their religion to mine…but leave me alone to enjoy and live my path without your negative or judgemental attitude. I don’t judge you so please do me the same favor. After all, I worship a Higher Being the same as you..I just do it differently. So Mother Nature is bringing on the snow again here in Ohio! We have gotten about 15 inches thru the last two storms..this one is to bring another 6-9 inches! I love the snow and Winter but I think enough is enough! It IS very beautiful though and it makes me nestle in and work around my house and various projects etc etc. Maybe it’s HER way of forcing us to focus inward and slow down and enjoy the beauty She’s giving us. The Olympics have been wonderful and I have trouble tearing myself away from the tv..thank goodness for DVR! I’m so proud of the American athletes, they are doing us proud for sure! I love the figure skating and the pairs started last night. Winning Silver in the Nordic combined for the first time was awesome, Apollo Ohno is so exciting to watch, the moguls were awesome! Just so wonderful to watch! I finished Ellen Dugan’s book “The Book of Witchery”. It was really an awesome book and I learned so much about my craft. The power that is available to us everyday and the ability to use it to our advantage in our spellwork is amazing. Today, while I’m snowed in, I’m going to start transferring what I learned to pages for my Book of Shadows…I love working on my pages, finding pics online to put on the pages, working out the style of the page, font, etc..so much fun and so personal to me. She also has full moon (ESbat) rituals for the days of the week..such as if a Full Moon is on a saturday etc. I learned alot too about the Gods and Goddesses that represent each day of the week and more about their personalities which made them go much more real to me. Today I will be doing my Storm Protection spell not to keep the storm away but to keep my power on! I don’t want to miss a minute of the Olympics! LOL I’ll have a fire crackling away soon and I made my famous chili yesterday so I’ll probably have that again..after all, it is usually even better the 2nd day! I love to cook and need the power to do that too! I think today I might make my no bake cookies and my mozzarella chicken! Good comfort food for a cold day. The next book I’m diving into is “Ostara” by Edain McCoy..as that Sabbat is coming up I want to refresh my knowledge and discover more about the Blessed day. Ostara is much like the Christian holiday of Easter (it would be since they set it up to mimic it on purpose)..it’s all about Spring, bunnies, eggs, lambs, spring cleaning, and flowers! I’ll be setting up my Ostara altar soon too and the spring cleaning needs to be started soon too! I love to do that. Purging, cleaning, organizing, simplifying the house makes me feel new and refreshed. I’ll be blogging about my activities along the way, getting ready for Ostara. Don’t forget if you visit my blog to click on the Social vibe charity box. It just takes a couple of minutes and doesn’t cost you anything…it’s for the environment, the earth, Mother Nature so it’s the best cause in the world! Last night I watched the opening ceremony for the Winter Olympics! Wow! What a great show the Canadians put on. The whole Nature theme was right up my alley! The aboriginals were beautiful in their ceremonial finery. When they made the Circle and then it widened and turned to the ocean with swimming graceful whales and fish it was so amazing. My very favorite part was Kd Lang singing “Hallelujiah” ….it was so smooth and effortless and beautifully melodic it really brought tears to my eyes. As did seeing our proud young athletes walk into the venue. My heart went out to the Georgian team too..you could see the pain on their faces from losing their young teamate. Such a loss but the show went on as it should. I look forward to being glued to the tv for the next 2 weeks so as not to miss one moment of the games…my DVR will be heartily used! My poor little Kitty, Harley, has an injury to her left front paw and leg. I took her to the Vet yesterday..luckily it is just soft tissue injury, nothing broken. She is on anti-inflammatory meds for 10 days to help her heal. She is staying quiet and laying on my lap alot (which I love!) and will be ok soon. I hate when an animal hurts..its not like you can explain to them why and they can’t tell you whats wrong. Poor baby. The vet said she may have been stepped on, or jumped off of something wrong, or playing with my other cat, Jasper could have caused it..who knows. I just know I’m glad she’s ok. As I am a Witch, I of course did a spell..a healing candle spell..to help her on her way. I believe fully that a burning candle, anointed with magickal oil and with my hopeful intention placed into it will aid her in healing. It’s Magick after all! We ended up with 14 inches of snow over a week and now we are hearing that we may get another 2-4 by tuesday! Mother Nature is putting on her own show this winter to rival the Olympics! Go Apollo!! Sorry, he’s racing now and i love him!!! OMG! He almost got 4th…but two Koreans fell and he got the silver..JC the other american got bronze …whoo hoo! Stunning race! Ok..back to the snow, while I love winter and love snow, I have to say enough already! Bring on the spring! 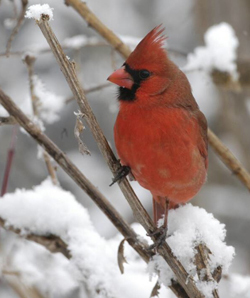 However, I will say too that I love watching the cardinals at the birdfeeder and resting in the snowy trees. The Goddess blesses me whenever I glimpse it. I bought yarn today to start a baby blanket in a soft lilac purple and I’m going to put a yellow ruffled edge on it. That will give me something to do while its snowing. I’m going to crochet this one instead of knit..its faster and easier and I haven’t crocheted in a long time so it will be a nice change for me. I love making soft lovely baby items and my grandaughter is definitely partial to knitted blankets over any other! I am getting very excited about our Book of Shadows arriving any day now..I hope! I’ve been working on pages for it and will spend some time tomorrow doing more I’m sure. It will be a blessed day when my sister, daughters and I can all sit down with our glue sticks and spells and information pages and start putting our books together..I can’t wait!! Wishing everyone a very Happy Valentines Day and my wishes for you are that you are loved by many! and then there was Sun! After two back to back Winter storms…about 4:00 this afternoon the sun came out! It was beautiful. The skies cleared and turned blue and the snow was glinting in the brilliance! I was soooo happy to see it! I love Winter as I’ve said before, but the dreary gray heavy skies can really get a person down. My spirit was lifted as soon as I saw the bright ball in the sky again. Today I had lunch with my daughters and grandaughter at Fridays..I love love love their sweet potato fries!…then we headed off to Barnes & Noble to have coffee and purchase various books. With Valentines Day coming, little board books were bought for little Lily, crochet books for Willow and I, and some gifts that I won’t mention here so as not to give anything away! While we were there I took Lily back to the Children’s section to run off some steam and play. They have a little table set up with a Thomas the Train set for the kids to play on. A little boy about 5 years old was playing there. My grandaughter became absolutely giddy about another child there playing and immediately started interacting with him. She laughed til she was weak kneed literally everytime he said anything or made an “engine” noise..she kept grabbing his arm to touch him and stay connected to him. Bless his heart he quickly realized he had her rapt attention and took advantage of it quickly..playing with her. It was sooo adorable, I wanted to laugh with her in her joy, and cry at the love I felt for her. I will never forget it…ever. She is just 14 months old but seems so much older..an old soul, I believe. She is very special, but of course I’m her Nana and would think so wouldn’t I??!! Tonight we are in the “dark moon.” The new moon will be on the 13th…I am trying to decide what I want to ask The Goddess to aid me in during that night. The new moon is for new projects, personal growth, healing and drawing abundance, money and success. I will ask for all those things in some way..I don’t have a new project planned as of right now so I will focus on the others. I love when after 3 days of the dark moon that the silver sliver shows up again in the sky and all seems right with the world. Tomorrow I’ll be going to the health food store to get the needed herbs and oils to do my spellwork. I’m almost finished with “The Book of Witchery” by Ellen Dugan and again, I strongly suggest it to those interested in Magickal Daily Correspondences..the information is invaluable and really helps me to be grounded and feel prepared for each day of the week. I’ve picked out the next book I’ll be starting on next. More on that yet to come. Have you seen the new show “Past Life”? It’s a good one, I highly recommend it. Whether you believe in reincarnation or not. I’m off to watch the show and do more reading. May you have a Blessed, restful night. I’m sitting here watching the snow fall softly and gently but in great amounts! We’ve gotten about 4 inches so far with the possibility of another 5 inches or so. Tomorrow it will be very windy with drifting snow. It is Mother Nature in all her glory! Perhaps this is the last blast of Winter before Spring rears her lovely head. I love days like this when I don’t have to go out..I can sit by the fire, drink my coffee, listen to good music, read, knit or work on projects around the house. I’m going to make it a blessed day. My sister Teagan has come early today..brought by her hubby in his 4 wheel drive. You see, my oldest daughter was injured in a terrible car accident 21 years ago at the age of 6. She is paralyzed and breathes with the help of a ventilator so she required some nursing care. My sister and my other daughter also help me take care of her. When the weather is bad, I can’t count on the nurses to get here, so Teagan came to help me. She’ll be here at least today and tomorrow and is spending the night “just in case”! Thank Goddess I have her to help. We enjoy our days together working on our Book of Shadows, knitting, reading etc. I have done a Storm protection spell to try to keep the storm from doing any damage or the power going out! I really hate when the power goes out. With my daughter relying on a machine to breathe we need power. She has batteries that keep her running for about 12 hours but then we must be able to charge her back up again. Two years ago we spent 9 days in a hotel because of a huge power outage…not that much fun! Today I’m going to start working on the Correspondences for the days of the week. I’m getting the info from Ellen Dugan’s book “Book of Witchery”. The information is amazing and so helpful…it will be nice to know how specifically I can make each day magickal..from what color I wear, what incense I burn, what I do at my altar, crystals, candles etc etc. I love it! Practicing my Path everyday helps me to feel centered and connected to Goddess and God. Makes me very happy. I love music..all kinds…and my Ipod is one of my favorite possessions. Today we are listening to celtic music.. I especially love Secret Garden, Loreena McKennitt and Enya. Celtic Woman is also wonderful.. I highly recommend them to you. Beautiful voices, beautiful meaningful songs. Perfect for a day like today. Well, stay warm and stay safe bloggers. If you visit me, live a comment..would love to know about you too and how you found me.